Public bike paths on Maui. Now that Maui’s North Shore Greenery bike trails are well underway with at least some funding allocated, it looks like the Maui County Council and other public entities may be starting to seriously look at other areas for bicycle path improvements and finding the funds to develop more riding trails for cyclists. On that positive note for both local and visiting cyclists to Maui, the county has announced council member Don Guzman, who holds the Kahului residency area council seat, will be hosting a community meeting at the Lihikai School Cafeteria on Wednesday, October 23 starting at 5:30 pm. 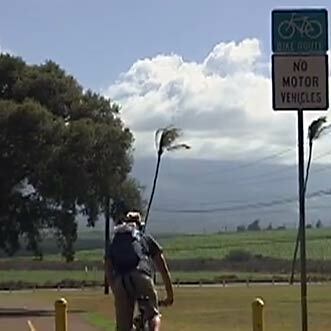 The Central Maui Pedestrian and Bicycle Master Plan is going to be presented at the meeting. Council member Guzman is also the chair of the Council’s Economic Development, Energy, Agriculture and Recreation Committee. In the announcement Guzman claims "A healthy and happy community significantly improves our quality of life in Maui County" and we couldn't agree more! Keep reading to find out how a couple lucky kids could go home from the meeting with a brand new bicycle and bike helmet! Central Maui Pedestrian and Bicycle Master Plan meeting poster. In addition to presenting the Central Maui Pedestrian and Bicycle Master Plan, topics to be discussed include the ‘Complete Streets’ program which was used when the master plan was completed back in 2012. A goal of ‘Complete Streets’ is to encourage bicycling and walking in Central Maui communities. Fitting well with the intent of the Healthy Hawaii Initiatives, Complete Streets describes a set of design principles promoting safe access for public users of all ages and abilities. Per council member Guzman’s’ statement in the county announcement "Having streets that encourage active living is a powerful way to address not only getting safely to our destination, but also much larger issues such as child obesity and energy-related impacts to our environment". Maui County Nutrition and Physical Activity Coalition (NPAC) is co-hosting the meeting with council member Guzman and the meeting is being held in cooperation with the YMCA’s Pioneering Healthier Communities project and the County of Maui Department of Public Works. Two children’s bikes with helmets will be given away to two lucky kids attending! Read the county announcement for the latest updates and more details. Add the important meeting to your calendar now and then make plans to attend on Weds, Oct 23rd, 2013. The meeting begins at 5:30 and will take place in the Lihikai School Cafeteria. Conrad Caveman returns for the 2013 XTERRA World Championship. Heading to the 2013 XTERRA World Championship on Maui in a couple weeks? Then be sure to take a look at these tips for the 2013 XTERRA World Championship. Remember to make an advance reservation if you need a bike rental for the XTERRA races! Just choose a bike from our bicycle rentals page, share a few details and complete the reservation! Your bike rental reservation will be confirmed for convenient fast pickup after you arrive on Maui. Then, just stop by at the West Maui Cycles bike shop in Lahaina to pick up your bike rental on your way up to XTERRA at Kapalua!